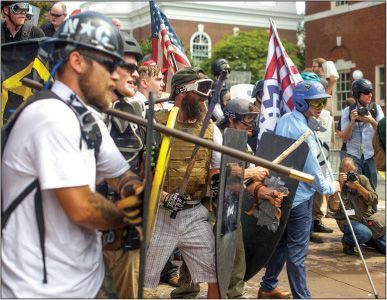 The ‘alt-right’ nationalists who converged on Charlottesville were proud of their racism, said journalist Terrence McCoy, and thrilled to find others who share their feelings of resentment and victimhood. FOR ALL THAT he did in Charlottesville, Va., chanting anti-Semitic slogans, carrying a torch through Emancipation Park, he wasn’t even aware that the “alt-right” existed one year ago. It wasn’t until Hillary Clinton condemned the movement in a campaign speech last August that he first learned of it, and from there, the radicalization of William Fears, 29, moved quickly. He heard that one of its spokesmen, Richard Spencer, who coined the name “alt-right,” was speaking at Texas A&M University in December, so he drove the two hours to hear him speak. There, he met people who looked like him, people he never would have associated with white nationalism—men wearing suits, not swastikas— and it made him want to be a part of something. Then Fears was going to other rallies across Texas, and local websites were calling him one of “Houston’s most outspoken neo-Nazis,” and he was seeing alt-right memes of Adolf Hitler that at first he thought foolish—“people are going to hate us”—but soon learned to enjoy. The “Unite the Right” rally in Charlottesville—which ended with dozens injured, a woman struck dead by a car, a president again engulfed in scandal, and another national bout of soul-searching over race in America—was a collection of virtually every kind of white nationalist the country has ever known. There were members of the Ku Klux Klan, skinheads, and neo-Nazis. But it was this group, the group of William Fears, that was not so familiar. The torch-lit images of the march through Emancipation Park revealed scores like him: clean-cut, unashamed, and young. They almost looked as though they were students of the university they marched through. The answer is complicated and unique to each person, but there are nonetheless similarities, according to lengthy interviews with six young men, ages 21 to 35, who traveled hundreds of miles to Charlottesville to the rally. For these men, it was far from a lark. It was the culmination of something that took months for some, years for others. There were plot points along this trajectory, each emboldening them more and more, until they were on the streets of Charlottesville, ready to unshackle themselves from the anonymity of online avatars and show the world their faces. FROM NEW ORLEANS, one man journeyed 965 miles. Another arrived from Harrisburg, Pa.—247 miles. Another drove all night, more than 20 hours in all, from Austin—1,404 miles. One more traveled from Dayton, Ohio—442 miles. 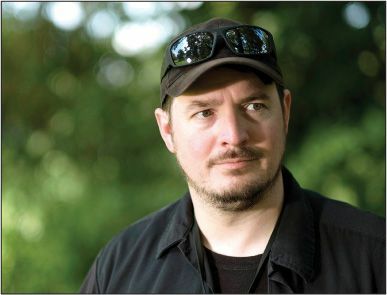 The road to Charlottesville, 540 miles away from his home in Paoli, Ind., began decades ago for Matthew Parrott, who at 35 calls himself “the first alt-righter,” referring to a small and decentralized movement of extreme conservatives, many of whom profess white-supremacist and anti-Semitic beliefs and seek a whites-only ethno state. What was going on: The same alienation and purposelessness that once defined his life had come to characterize that of so many others. An economy capsized, a job market contracted, a student-loan crisis erupted, and feelings of resentment and victimization took hold among some members of Parrott’s generation. “This is not some hypothetical thing,” said Parrott, who soon established the white nationalist Traditionalist Youth Network and started recruiting. “This is, ‘I’m stuck working at McDonald’s, where there are no factory jobs and the Boomer economy is gone and we have got this humiliating, degrading service economy.... They feel the ladder has been kicked away from them.” And who was to blame for all of this? Those who joined the alt-right did not view impersonal economic factors or their own failings as culprits. There came a moment for every young man interviewed when they felt whites, and particularly white men, had become subject to discrimination, a perception that formed the foundation of their new identities. For Tony Hovater, 29, of Dayton, it came after he had dropped out of college and was touring as a drummer in a metal band, and he passed through the small towns of the Rust Belt and Appalachia. He started thinking that so much of the national narrative focuses on the plight of poor, urban minorities, but here was poverty as desperate as any he had seen, and yet no one was talking about poor whites. “You see how a complete system failed a group of people and didn’t take any responsibility for it and has done nothing to help,” he said. 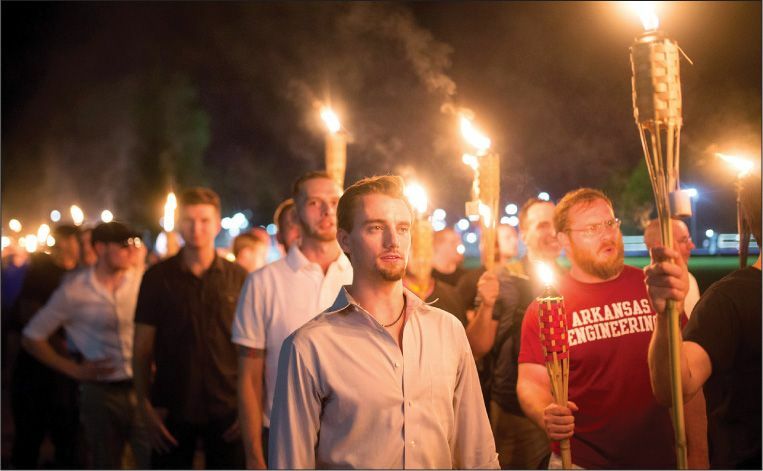 FROM THESE DISPARATE geographies, social classes, and upbringings—rich and poor, rural and urban, educated and not—they converged on a single place in August, Charlottesville, with a shared belief that they, white men, are the true victims of today’s America. “I wanted to be in the fight,” Perrin said. “I need to be more aggressive,” Parrott said. “We never fight for anything,” Fears said. The violence that they would mete out and receive on the streets of the picturesque college town was the most pivotal moment to date in the evolution of the alt-right, the men interviewed believe. The alt-right has always been a diffuse movement, but it has also been intensely communal. People make and share memes that glorify President Trump and make jokes of Hitler and the Holocaust. They discuss events on 4chan, Reddit, and Discord. They get to know one another despite a distance of hundreds of miles. They learned not to fear being called a racist or a Nazi, and in fact, some found it liberating, even “addicting,” as Parrott said. “Little savages,” Starr said of the counterprotesters. “Subhuman,” Perrin said. Neither the day’s events leading to the car crash that killed Heather Heyer and injured 19 others, nor the condemnations from politicians and people across the country that followed, have convinced those interviewed that their beliefs are wrong. For some, it only confirmed their sense of victimhood. They felt silenced and censored, deprived of their rights. They felt as if the death of Heyer had changed everything, and that uncontrollable forces had been unleashed.